Some of the 2018 Faulkner Pilgrimage attendees pose with Meg Faulkner DuChaine (far left), William Faulkner’s great niece, at the author’s home, Rowan Oak. 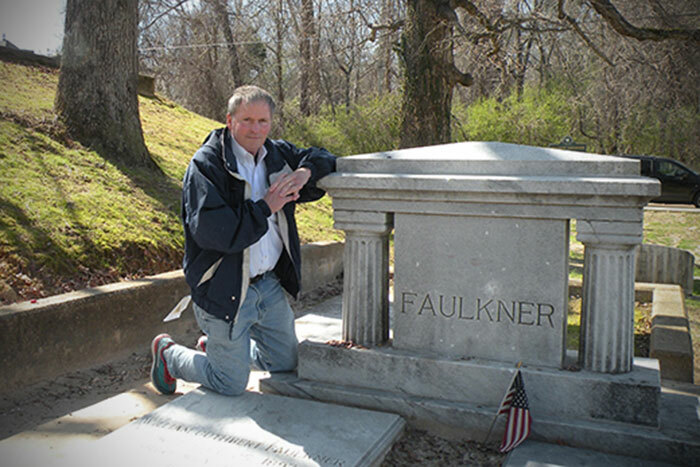 Clyde Partin Jr., a physician and professor in the Emory School of Medicine, poses at Faulkner’s grave. Thirty-five years ago, during his senior year at Emory University School of Medicine, Dr. W. Clyde Partin Jr. did something unexpected for a student immersed in the medical sciences — he lobbied for a literature class. With the help of classmate Walton Reeves Jr., who had majored in English as an undergraduate, they appealed to Emory’s acclaimed physician-poet John H. Stone III to create and teach a course that explored the intersection of medicine and literature. “Our love of literature was the crucible here,” says Partin 79C 83M, now an associate professor of medicine, Rollins Distinguished Clinician, director of the Emory Special Diagnostic Services Clinic at Emory’s School of Medicine, and a published poet. A cardiologist and educator, Stone was an internationally recognized poet and essayist who would serve on the Emory medical school faculty for 40 years before his death in 2008. Partin recalls him as a man who believed that literature could help imbue within physicians the importance and complexity of both their patients and their own humanity. In the end, Stone agreed to help, creating one of the nation’s first medical school courses to combine literature and medicine. In the years that followed, he would go on to teach it at Emory and Emory’s summer studies program at Oxford University, and see similar courses flourish across the country. Now, that tradition has come full circle. Four years ago, Emory alumna Sally Wolff-King 79G 83PhD approached Partin with a proposal to revive Emory’s “Literature and Medicine” course. It was a fitting collaboration: When Stone launched the course, he had conferred with Wolff-King to create a course syllabus and would invite her into the classroom as a guest lecturer every year. Designed as an elective for fourth-year medical students, the re-launched seminar course focuses on the works of both physician writers and poets and those who aren’t physicians but write about medical issues. This semester’s class includes 11 medical students who are studying texts that draw from a rich trove of literature: Eudora Welty’s “The Optimist’s Daughter,” William Faulkner’s “As I Lay Dying,” surgeon Richard Selzer’s essay collection “The Exact Location of the Soul,” and “On Doctoring,” a collection co-edited by Stone and physician Richard Reynolds, among others. 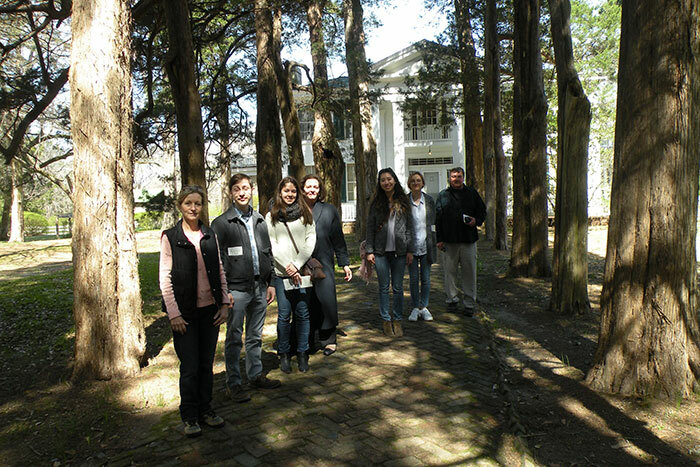 To help the literature come alive, this spring Wolff-King and Partin borrowed from another page of Emory history, taking class members — and some interested alumni — on a four-day field trip to Mississippi to explore the literary landscape of William Faulkner. Long known as “the Faulkner pilgrimage,” the trip dates back to 1954 when Floyd Watkins, Candler Professor of American Literature, began visiting Faulkner's home in Oxford, Mississippi, to research the famed Southern writer. In time, he began bringing along Emory students to experience the people and places that inspired Faulkner’s stories. In fact, that’s how Wolff-King was first introduced to the literary adventure. “Professor Watkins was my dissertation director, and while I was in graduate school in English at Emory, I attended one such trip in the late 1970s,” she says. When Watkins retired, Wolff-King — a respected Faulkner scholar herself — continued leading student trips. Now a longstanding Emory tradition, the pilgrimage has remained popular among those who relish the chance to hold Faulkner ephemera, walk the streets where he lived and visit face-to-face with members of his family. In the years that Wolff-King has led the Faulkner pilgrimage, she’s guided many spirited discussions about the Nobel Prize-winning writer. But rarely has she heard participants posthumously diagnose his likely cause of his death. But that’s what happened earlier this month with a touring group that included students from the Emory University School of Medicine and Emory College of Arts and Sciences, alumni of Emory College, a physician faculty member from the School of Medicine, and others. Historians believe that Faulkner’s death was preceded by a fall from his horse. He lingered at home in pain for several days before being taken to a sanitarium in nearby Byhalia, Mississippi, where he died soon afterward. Was it a heart attack? A blood clot in his lungs? The students had a similar debate about the fate of the character Addie Bundren in Faulkner’s novel “As I Lay Dying” — a natural result of a medical focus on literature in this course, Wolff-King notes. Over four days, participants visited Rowan Oak, Faulkner’s home, touring rooms where the author liked to read and write; the home of a relative, who shared family stories and some of the author’s personal effects; the cemetery where Faulkner and his family are buried; and the buildings, streets, rivers and landscape from which he drew inspiration. Touring the archives at the University of Mississippi, they were also able to view original drafts of his works. Andrew Ebner, a fourth-year Emory medical student, was drawn to both the class and the pilgrimage out of a love of literature. And it didn’t disappoint. Beyond the literary focus, Ebner, who plans to study psychiatry, says medicine was woven into discussions along the way. For instance, a trip to a graveyard in Holly Springs, Mississippi, illuminated the public health crisis of the Yellow Fever epidemic of 1878, which resulted in some 20,000 deaths throughout the Lower Mississippi River Valley. Ebner was intrigued to find towering cedar trees lining the pathway to Faulkner’s home. There was a time when cedar was thought to ward off mosquitos. He wondered: Could they have been planted in response to the epidemic? Sophia Neitsch, a junior majoring in English and comparative literature, joined the trip with the support of the Department of English in Emory College. She praised the experience for providing new insight and context to engage with the work of Faulkner and his Southern contemporaries. This was the first time that Partin’s busy clinical schedule allowed him to join the literary pilgrimage, and he found it deeply rewarding. “It was fascinating to see these places that inspired Faulkner — having dinner where a character got off a train, seeing a road that featured prominently in one of his books, visiting a spring where he took his horse to get fresh water,” he says. As a poet, Partin was inspired. “It’s given me some new ideas of what to write about, how to create characters and connection,” he explains. And as a physician, there are threads of the experience that he will carry back into both the classroom and the exam room. “When I listen to a patient, I believe it helps that I have spent time trying to interpret literature, studying an abstract idea and how to distill it. In fact, I often find that it can help me make a diagnostic connection,” Partin says. “Through this class, I really learn more than I teach,” he adds.